Honda Shine can be described as a combination of all the best features expected in a bike – clubbed in one bike. Honda has very well understood the mood of the market and the expectations of the people. The result is for everybody to see – a wonderful bike. Appearance: Honda Shine is available in various color variants – Wild Purple Metallic, Champion Blue Metallic, Alpha Red Metallic, Geny Grey Metallic and Black with Grey Stripes and Black with Blue Stripes. The bike has, Multi Reflector 12V/35W Headlamp, Aerodynamic Front Cowl, Grab Rail, Intense Rail Lamp, Fuel Tank Knee Grip, Moderate Bending Forward, Inclined Muffler, Alloy Wheels and new age body graphics. The fuel tank comes with well designed knee recesses and a chrome filler cap. Comfort: Honda Shine has various advanced comfort features. Wide seating space gives comfort to the rider. The bike has been designed with lightweight advanced diamond frame. Double suspension system provides superior absorption of shocks and vibrations. Honda Shine has Analogue Fuel Gauge, Analogue Speedometer, Passenger Footrest, Pass Light and Low Fuel Indicator. Safety: Honda Shine has laid special attention for safety of the rider. The bike has telescopic Fork (Front) Suspension and 3 Step Spring Loaded Hydraulic Shock Absorber (Rear) Suspension. Braking System is being taken care by 240 mm (front) disc brake and 130 mm (rear) drum brake. 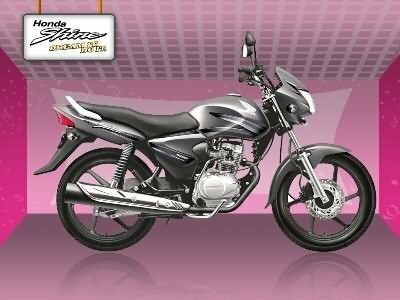 Engine: Honda Shine has 124.6 cc, 4 stroke, OHC, Air-cooled, Single Cylinder engine. The “Optimax” engine produces a maximum power of 10.3 bhp at 7500 rpm and a maximum torque of 10.9 Nm at 5500 rpm. It has CDI ignition and Constant Mesh 4 Speed Gear Transmission. Price: The price of Honda Shine is Rs. 54,500 (taking Mumbai as base price location). However, the price specified is indicative price only and reflects lowest approximate price which excludes tax, registration, insurance and cost of accessories.